Produced biennially, The World's Water provides a timely examination of the key issues surrounding freshwater resources and their use. Each new volume identifies and explains the most significant current trends worldwide, and offers the best data available on a variety of water-related topics. 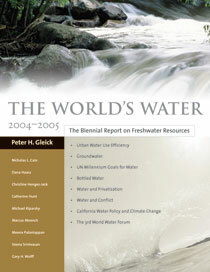 This 2004-2005 edition of The World's Water features overview chapters on: conservation and efficiency as key tools for meeting freshwater needs; bottled water quality, costs, and trends; United Nations millennium development goals; groundwater issues; case studies of water privatization; the economic value of water; California water policy and climate change. -Can the Principles Be Met? -Defining Water "Conservation" and "Efficiency"